Though mobile phones are popular, most people continue to use watches and clocks because they are inexpensive and do not require regular recharging like mobile phones. Also, mobile phones have expensive electronics which can be easily damaged when exposed to water. However, most of the watches and clocks available are battery operated, and the battery has to be replaced periodically. It is expensive to go to a watch repair shop for battery replacement and other repairs, so many people are looking for a watch repair kit, which will allow them to open up and repair their watch or clock if they are facing any problem. 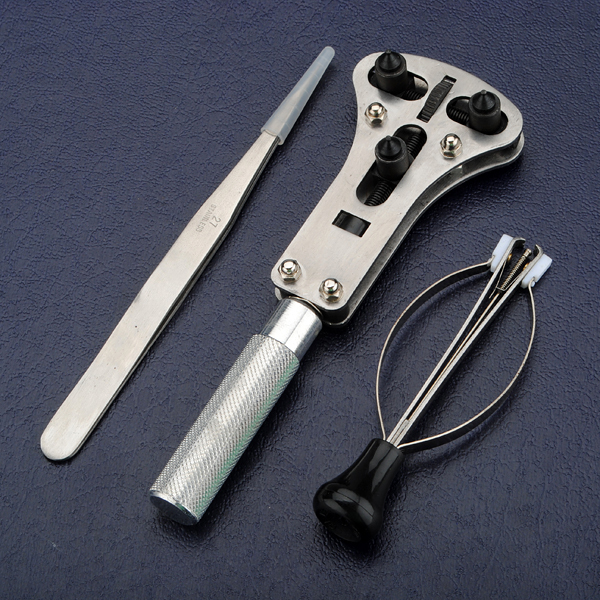 The watch repair tools kit available online has 20 pieces and includes a hand and pin remover. It is a complete set of watch repair tools which can be used by professionals repairing watches and clocks since it has everything which they require for repairing wristwatches, watches, clock. The tools are supplied in a high-quality case package so that any tool can be removed or kept back as required. One eye loupe is supplied for magnification so that the person repairing can see the various parts of the watch and clock more clearly while repairing or replacing any component. Though a watch is small, it has a large number of components, and the toolkit contains specialized tools for handling each component easily. For removing the link pins in the watchband, one remover is available while another remover for link pins comes with two extra pins. For opening the watch case, a case holder, case opener and wrench for the watch back are available for you. Similarly, for the watch band, a band holder and a band remover are provided for you. There is a spring bar remover with two extra pins and a miniature spring bar remover for smaller watches. A polishing cloth is provided to polish the watch which may be dusty or covered with dirt. To open the different kinds of watches quickly and easily, three different slotted screwdrivers come with three extra blades. Additionally, one screwdriver with a Phillips’ head is available. For handling the various small parts of the watch easily one pair of tweezers is provided for you. There is also one pair of pliers with a chain nose, and side cutters for handling the various parts of the watch. The dual-headed hammer can be used to remove any part from the watch or clock which has to be replaced. 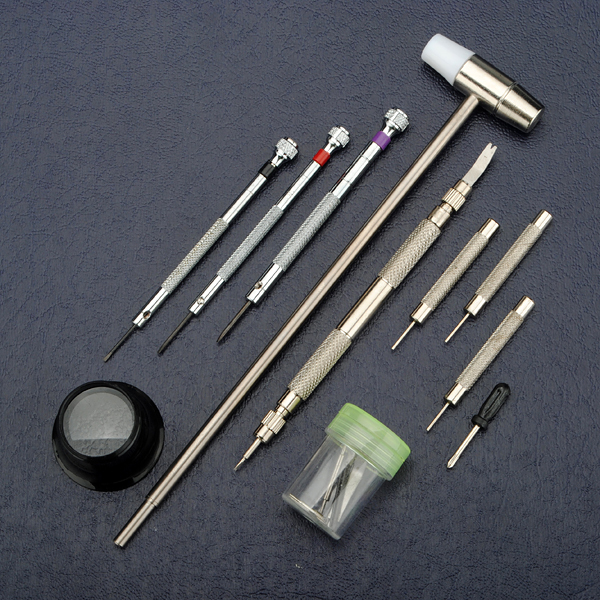 A cylindrical plastic case with a cover is also provided to store the small pins and other components which may be required for repairing the watch. 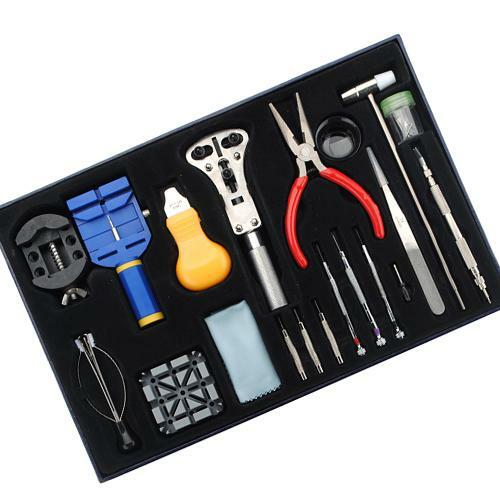 So the inexpensive 20 pieces kit for watch repairs contains all the tools required for repairing watches, clocks is a good deal at Banggood site.